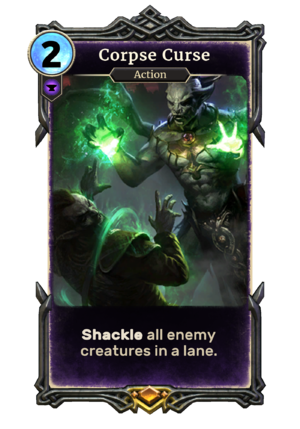 Shackle all enemy creatures in one lane. Corpse Curse is a legendary Endurance action card. It cannot be included in a deck, but is a Blood Magic Spell that can be placed in your hand by the Blood Magic Lord. This page was last modified on 24 September 2018, at 22:32.